Re-usable produce bags are a great idea to reduce single-use plastic packaging! Simply fill the bags with fresh produce at the store (or market), pull the drawstring to close the bag, and carry your fresh fruits and vegetables safely home. The semi-transparent cloth makes identification clear for the checkout operator without the need to open the bag. 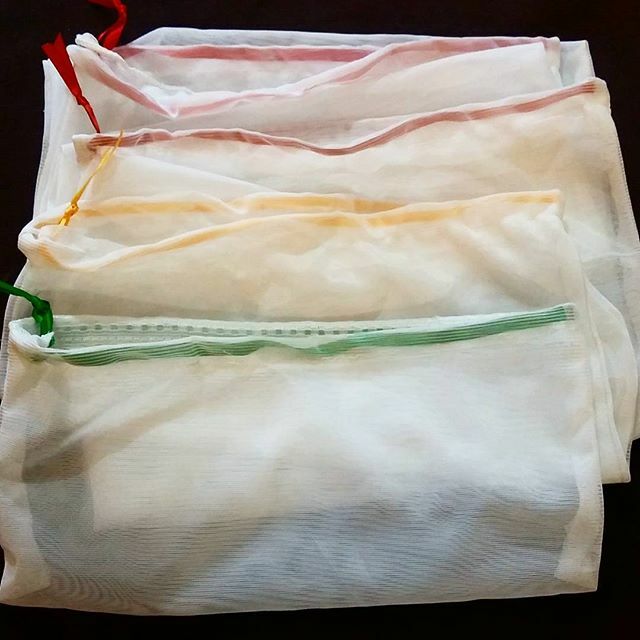 These produce bags are cheap, simple to sew and strong enough to hold around 2kg of produce, plus they make great gifts! 1. Work out what size/s of produce bags you want to make. 2. Measure and mark fabric. 3. Cut fabric to size/s. 4. Fold fabric in half, with the "good side" on the inside (i.e. print on the inside if your fabric is printed). The fold will be on the bottom to become the base of the produce bag. 5. Pin sides, leaving the top open. 6. Sew sides (around 1cm from the edge) in a straight or zig-zag stitch, removing pins as you sew. 7. Fold down the open top around 1cm and pin down (or use the sewing machine foot as a guide) and sew around the top to create the drawstring loop, leaving a 1cm opening to insert the ribbon/cord. 8. Cut ribbon/s to size. 9. Attach the safety pin to the end of the ribbon and insert into the opening, pushing along until it creates the drawstring. 10. Tie ribbons into a knot and cut each ribbon end at an angle to prevent fraying. 11. Turn bag inside out (right way out). 12. Your re-usable produce bag is ready to use! Ideal for: chillies, dried fruit, garlic, ginger, herbs, nuts. Ideal for: avocados, beans, berries, grapes, kiwifruit, lentils, mushrooms, peas, rice. Ideal for: bananas, capsicum, carrots, corn, cucumbers, onions, tomatoes, zucchini. Ideal for: apples, celery, leeks, oranges, pears, potatoes, silverbeet, sweet potatoes. Ideal for: broccoli, cabbage, cauliflower, lettuce. o Making your own is much cheaper than buying re-usable produce bags, which retail for around AU$20 for 8 bags! o An old curtain makes many produce bags and is a great way to reduce waste! o Remember to wash your fabric before cutting them as some fabrics may shrink. o Want to add some embellishments? Wash the fabric, cut to size and then stamp, stencil or sew on fabric before pinning and sewing into bags. o You can make produce bags any size you want! Add 2cm to the final bag width and 4cm to the final bag height to allow 1cm hem on all sewing sides. o Sizes may vary due to being handmade. o The low bag weight will be added to the net weight at the store - remove produce before weighing and paying if you prefer. 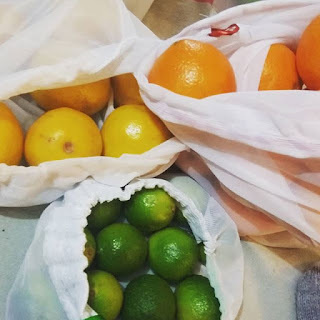 o Use different coloured ribbons or beads for different sized bags if you like - we used green ribbon for mini produce bags, yellow ribbon for small produce bags, orange ribbon for medium produce bags, red ribbon for large produce bags and blue ribbon for square produce bags. o The ribbon size is calculated by the width of the bag x 2 + 15cm i.e. 30cm x 2 + 15 = 75cm for the sizes listed above. o Store produce bags all together before visiting the store, or perhaps keep them sorted - we made 5 or 6 of each size, and stored the same size in the last bag so they were easy to get out at the store to use. o Making lots of produce bags? Cut them all at once, then pin all at once and then sew etc. to make them quickly and efficiently. o Hand wash produce bags in soapy water and hang to dry before storing (or wash in a large produce bag on cold machine wash, but this will reduce their lifespan). o You can use these produce bags to store potatoes, onions etc. in the pantry (away from sunlight). o You can rinse fresh fruit and vegetables in the bag - hang to drain and dry before storing the fruit. o Remember to put them back into your bag before your next shop. o Netted produce bags can be used for many other things around the home! o Why not make some extra bags and share with your family, friends and workplace. o Pay it forward: teach someone else how to make their own re-usable produce bags to reduce plastic bag use in your community!